Displaying 1 - 58 of 58 items found. This pleasing purple crocheted top, features short sleeves and an attractively edged neckline. It's sure to dress up you wardrobe. Size: Woman's small (medium, large). Layers of ruffles form the confectionery edging on this stitched tabletop pair, a summertime treat for dining guests. 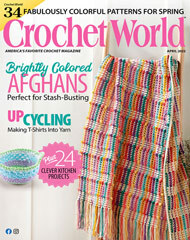 This e-pattern was originally published in the June 2010 issue of Crochet World magazine. Size: Doily: 7 3/4" diameter. Napkin Ring: 2 x 2 3/4". Made with size 10 crochet cotton thread and size 2 (2.20mm) steel hook. A flag-waving, patriotic salute to the Fourth of July! Size: 11 1/2" fashion doll. Our fashion doll is ready for the barbeque. She's all turned out in those colors that don't run - red, white and blue! Size: 11 1/2" fashion doll. Crocheted using worsted yarn. Size: 38 3/4" x 67". Bring a bit of Holland into your home with this colorful Tulip Patch Afghan crocheted using worsted-weight yarn. Size: 44" x 61 1/2".